Tag line: "On Friday the 13th, Jason is back. But this time, someone's waiting"
Billed as “Jason vs. Carrie”, Friday the 13th Part VII: The New Blood is a unique entry in the series, providing us with a main character who does more than just stand up to Jason; she gives him a run for his money. We open with a flashback, during which a young Tina (played as a child by Jennifer Banko), who's with her family at their vacation house on Crystal Lake, overhears her parents fighting. Confused and upset, she takes a small boat out to the middle of the lake. Her father (John Otrin) tries to coax her back in, at which point something incredible happens: Tina, shouting that she hates her father and wishes he were dead, unleashes a power deep inside herself, a form of telekinesis that causes the dock to collapse. Realizing what she’s done, a tearful Tina calls out to her father, but it’s too late; the dock sinks to the bottom of the lake, dragging her dad down with it. We jump ahead a few years. Tina (Lar Park-Lincoln), still troubled by the death of her father, has been in and out of psychiatric hospitals. In an effort to help her confront her past, Dr. Crews (Terry Kiser) recommends that he accompany Tina and her mother (Susan Blu) to the house on Crystal Lake, which would mark the first time anyone has returned there since that tragic night. Believing it’ll help her daughter’s recovery, Tina’s mom agrees, but the truth is Dr. Crews has his own reasons for wanting to return Tina to the scene of her trauma. Realizing her powers are triggered only when she’s upset, he hopes that the deep emotions this trip will stir up will bring her telekinesis to the surface, thus allowing him to videotape and document this strange phenomenon. Sure enough, Tina’s powers return in force, and during one particularly strong event, she inadvertently frees serial killer Jason Voorhees (Kane Hodder), who, for the last 10 years, was trapped in the lake. Roaming the grounds of Crystal Lake once again, Jason sets his sights on a group of young people staying at the house next door to Tina’s, who’ve gathered for a surprise birthday party. With the help of Nick (Kevin Spirtas), one of the guys from next door, Tina sets out to find Jason and, if possible, destroy him, but how many will die before she does so? 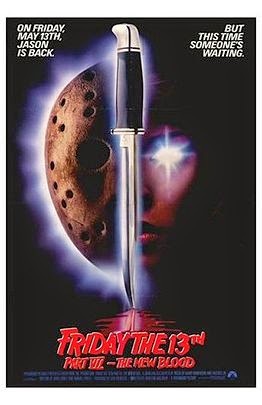 To “catch us up” with what’s already happened, Friday the 13th Part VII: The New Blood begins with a brief introductory scene narrated by Walt Gorney, featuring clips from Part 2, The Final Chapter, and, to a greater extent, the finale of Jason Lives, which explains how Jason ended up at the bottom of Crystal lake. It was a neat way to open the film, but like all previous entries in the series, what makes Friday the 13th Part VII: The New Blood is its kill scenes, with Jason wielding everything from his trusty machete to a gas-powered Weed Wacker to get the job done. Of them all, though, the most memorable kill occurs when he comes across a couple of campers, who’ve pitched a tent in the middle of the woods. After finishing off the guy (played by Michael Schroder) while he was collecting firewood, Jason heads back to the tent, where the girlfriend (Debora Kessler) is lying naked inside her sleeping bag, Without skipping a beat, Jason cuts his way into the tent, drags the sleeping bag outside, and bashes it against a tree, killing the girlfriend almost instantly. Lar Park-Lincoln delivers a solid performance as Tina, who, despite her turbulent past, has the ability to put Jason Voorhees in his place. Having learned to control her telekinesis, Tina uses it against Jason, tying him up with the roots of a tree (which she moves with her mind), slamming him into a mud puddle, and then electrocuting him with high-voltage wires. Of course, as anyone knows, it takes a lot more than that to finish off Jason Voorhees, and sure enough the final showdown between the two lasts for quite some time, growing in intensity as it progresses. On the down side, many of the teens assembled to serve as Jason’s victims in The New Blood are never more than stereotypes: the mean-spirited rich girl (Susan Jennifer Sullivan); the sci-fi nerd (Jeff Bennett); the good-looking tough guy (Jon Renfeild), etc. What’s more, the film’s ending is so ridiculous that it’s more likely to cause laughter than it is screams. Fortunately, these hiccups don’t spoil the movie, and while it may not be as bloody as the series’ first entries (like Jason Lives before it, The New Blood was heavily censored by the MPAA, resulting in very little on-screen gore), it’s still a hell of a lot of fun.